The Miss America Organization has a new set of high-powered Washington hands to help prepare for its 90th anniversary and return to network television. Regina Hopper, President and CEO of America’s Natural Gas Alliance and Miss Arkansas 1983 has joined the Miss America Board of Directors. “Regina’s unique experiences and expertise at the crossroads of law, business, political advocacy and media will add an important dimension to the diverse group of influential professionals serving on the Miss America Board of Directors,” said Board Chairman Sam Haskell, III. Hopper has served as executive vice president of the United States Telecom Association and the American Trucking Associations, and won an Emmy while at CBS News for her work on 48 Hours. Prior to her time in media, she practiced corporate and securities law and litigation communications. Hopper joins fellow Board members John Bermingham, Miss America 1971 Phyllis George, Tammy Haddad, Miss New Jersey 1973 Sue Lowden, Ed Peterson, Corinne Sparenberg, Barrie Jane Tracy, Paul Turcotte, Miss New Jersey 1971 Lynn Hackerman Weidner, Miss America 1964 Donna Axum Whitworth, and Ryan Wuerch. As the world’s largest scholarship program for women, last year the Miss America Organization and its state and local organizations made available more than $45 million in cash and scholarship assistance. The pageant is returning to network television in January under an exclusive multi-year deal with ABC. Chen: Fox News' front-row seat a "travesty of a decision"
Fox News Channel Chief White House Correspondent Major Garrett announced he’s joining National Journal as a Congressional Correspondent on September 3, just in time to avoid the new war over Fox News‘ front-row seat in the White House Briefing room. Fishbowl DC brings word that Jim Glassman’s Ideas in Action will join the Sunday local viewing habits in September. The half-hour show will “air weekly on two public television stations – Howard University Television (WHUT Channel 32) at 9:30 a.m. and Maryland Public Television (MPT) at 8:30 a.m.” The show will continue to be taped from the Newseum and on location in Dallas. Glassman, a former host for Capital Gang Sunday and current executive director of the George W. Bush Institute, leads the discussion series that focuses on central topics such as cybersecurity or dissent on the Internet rather than rope-a-dope talking points about traffic jams in Los Angeles. Ideas currently airs in select markets via PBS and streaming via its website. You can check for local availability here. If you’re playing at home, that means your average Sunday can now include Ideas In Action among every other show you keep DVR’ed for Monday Morning Talking Points. [picappgallerysingle id=”9561808″]The people of Los Angeles found out there is a price for their idyllic weather and sprawling commute last night: $1 million. That’s how much a private fundraiser held for President Obama garnered according to TheWrap. Held at the home of producer John Wells, Hollywood came out to hear the president explain his upcoming legislative agenda and other remarks in the relaxed atmosphere of a walled garden. Even AP's homepage fails at the "lol"
The Associated Press will not haz a cheeseburger after all. The main question (“How does an old media monolith like the AP remain hip and relevant in the age of cats with white text?”) is a frivolous statement. The AP has one of the better mobile apps through iTunes, but still suffered earlier this year when Google News revealed it would not host any new content from AP after contract negotiations failed. Of course, you could always just use Skitch. The “T” Team – Todd and Tapper – should consider themselves warned (that’s NBC’s Chuck Todd and ABC’s Jake Tapper). Marc Ambinder has lots of sources and long-time relationships in politics; he’s a must-read political blogger for TheAtlantic.com, curates their Politics channel, and is the chief political consultant to CBS News. 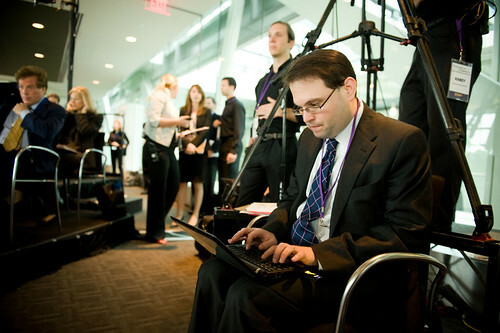 Ambinder is also half of the new “A” team recruited to help cover the White House for the National Journal Group. NJ tripled its White House Team with the addition of Ambinder and Aamer Madhani, currently a correspondent with USA Today. They will be joining staff writer George Condon, Jr., who covers the White House for CongressDaily when the National Journal newsroom is unified this fall. Ambinder was also a founding editor of Hotline’s path-breaking news blog, Hotline On Call and one of the founders of ABC’s The Note. He will continue with The Atlantic through the November elections and join National Journal Group immediately thereafter. Madhani covers foreign affairs for USA TODAY out of Washington, DC after joining the paper in December 2008 as the Baghdad Bureau Chief. He has also worked with the Chicago Tribune. Madhani will begin his work with National Journal next month. While Robert Gibbs may be becoming the August cable poster boy, the President has been meeting the press. Last Thursday, eleven White House reporters sat down with President Obama for an off-the-record lunch. The President has talked off-the-record recently with commentators like MSNBC’s Rachel Maddow and The Washington Post’s Eugene Robinson, so what makes it so newsworthy this time? Is it because it took some digging to find out who the Lunching 11 were? The Upshot outed them last week (Associated Press, Bloomberg, Los Angeles Times, Politico, Reuters, Wall Street Journal, Washington Post, and USA Today). Or is it because the New York Times has been so outspoken about refusing the White House invite? Mid-week announcements are the best when it concerns White House Press Pools. So without further ado, as Fishbowl DC informs us, Ben Feller is the AP’s new White House Correspondent. Feller covered education for the news organization from 2003 to 2006, switching to the White House since then. It shouldn’t come as a surprise that Meredith Fineman carries her parents journalistic tradition into new media. Her father, Howard, is leading political light for Newsweek and NBC News; her mother, Amy Nathan, now at the FCC, got her start reporting for the Washington Post. Fifty First (J) Dates is the 23-year old’s way to meet people after returning to her hometown of Washington, D.C. after working abroad in Buenos Aires. “At first I didn’t tell them about it,” Fineman said. “They found out from other people about ‘how fabulous it was. '” The point, Fineman assures, is to be fun and humorous about dating in D.C. instead of a return to Washingtonienne.